Increased fuel taxes carry the potential to mitigate carbon emissions, reduce congestion, and improve local urban environment. As such, higher gasoline taxes could prove to be a fundamental part of any climate action plan. However, they have been resisted by powerful lobbies that have persuaded people that increased fuel taxation would be regressive. Reporting on examples of over two dozen countries, this book sets out to empirically investigate this claim. 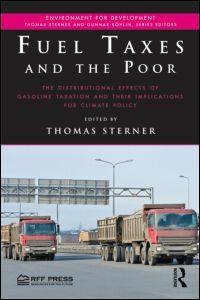 The authors conclude that while there may be some slight regressivity in some high-income countries, as a general rule, fuel taxation is a progressive policy particularly in low income countries. Rich countries can correct for regressivity by cutting back on other taxes that adversely affect poor people, or by spending more money on services for the poor. Meanwhile, in low-income countries, poor people spend a very small share of their money on fuel for transport. Some costs from fuel taxes may be passed on to poor people through more expensive public transportation and food transport. Nevertheless, in general the authors find that gasoline taxes become more progressive as the income of the country in question decreases. This book provides strong arguments for the proponents of environmental taxation. It has immediate policy implications at the intersection of multiple subject areas, including transportation, environmental regulation, development studies, and climate change. Published with Environment for Development initiative.